It continues to be extremely important for people in the rest of Europe to support Greece. Not only for the sake of the Greeks, but for the sense of the future of democracy in Europe, and for the possibility of a break with neoliberalism. Yet there’s a risk of developing the political and analytical blindness of the spectator, when you focus all your attention on the centre of action. Because the story is told of us. No, I don’t mean that in the banal sense, where “we” are responsible, because “our” institutions are doing something bad to Greece. Sure, that’s true in some sense, but the politics based on guilt or responsibility only takes us so far. It doesn’t touch on the lived experiences and material situations of ourselves and of people more broadly. As the likelihood of both Grexit and Greek default on its debt is increasingly rapidly, we need to start asking: What is the meaning of Greek default and Grexit for ordinary people in the rest of Europe? So far this question is mostly asked in spectacular terms, with reference to the risks of financial contagion (“Lehman Bros the sequal”) and political instability (“Putin in Peloponnese”). But the process might be slow and grinding. What we need to think through is the problems and possibilities that arise with the fact that most of Greece’s debt is already socialised twice. From the banks it was passed onto the Greeks, and now most of it is on the books of other European countries. And this will not just be about German taxpayers wanting to punish Greece for their supposed profligacy and laziness (but such lies can become increasingly important). 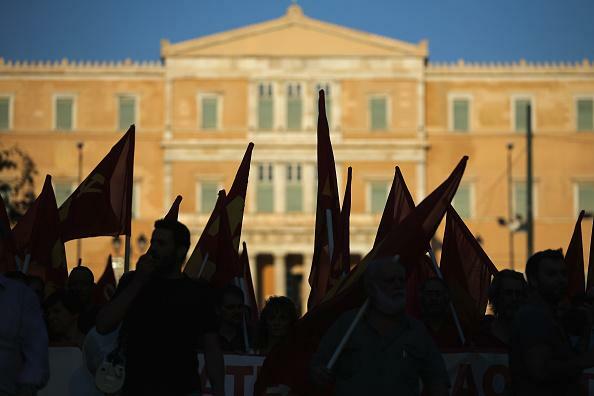 There will be a price to pay for Greek default – the question is who will be made to pay. And this difference makes all the difference, between the racist sentiments characterising the German debate, and a politics of change and justice. – Most basically: the inflow of money squeezed from the Greeks will dry up in the creditor countries. This shortfall will have to be covered in some way – either through cuts or increased taxes. – More importantly: Refinancing debt or taking on new debt will become increasingly expensive, especially in peripheral countries like Spain and Italy. This means less private and public investments and increased debt repayment costs. – An economically weakened Europe will also increase British and Danish insularity, and migration from the European periphery to non-euro EU countries. In a stagnant economic situation this will put downward pressure on wages and working conditions, or at the very least invoke the spectre of it, at the risk of increased racism. The effect of all this will be increased austerity and unemployment in the Europe, especially in the eurozone. And it might not happen through the excitement of fast contagion, but rather in a slow, draining way, as an increased squeezing of living standards. It might not even be televised, so spectators will be free to ignore it. – How to avoid that this squeeze is blamed on the Greeks? How to place it on the real culprits: the banks and the politicians who socialised the bank’s debt in the first instance? My sense is that this narrative is rare and wilfully ignored in the mainstream media of most Europe, and that this can’t be the primary terrain of struggle. Real gains on this terrain of narratives depends on our capacity to build other narratives and common sense outside the mainstream media, starting in the lived everyday of people. – How to organise against austerity this time around, when it largely failed the last time? How to move beyond symbolic manifestations and blockades, and short-term localised resistances, and build real social leverage? – How to build electoral leverage on the basis of this social leverage? — I say on the basis of, because in Greece Syriza only arose after a broad process of social politicisations through the movements. And this last six months we have seen that Syriza’s capacity and willingness to take up the fight lies in its social basis. Without that Syriza would have either sold out or been forced to surrender. Greece inspires us, but it cannot save us. 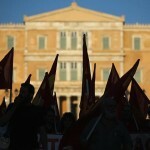 At best, the Greek situation can be the beginning of a profound democratic break with neoliberalism in Europe. At worst, it can mean the retrenchment of austerity and racism in a weakened and more authoritarian Europe. The difference between these outcomes is not made in Greece, but everywhere in Europe.